Bunch of Five 警察官 エピソード5: "Miles Better"
Love in the 21st Century ジョン エピソード1: "Reproduction"
2012 Playhouse Presents ウィル シリーズ1、エピソード1: "The Minor Character"
2010 コンステレーション・アワード、2009年度SFドラマ最優秀男優賞:"Doctor Who: The Waters of Mars"
^ Hoggart, Simon (2006年1月14日). “Alcoholic? Not the Kennedy I knew”. Simon Hoggart's week (London: The Guardian). http://www.guardian.co.uk/politics/2006/jan/14/politicalcolumnists.politics 2008年7月5日閲覧. "（訳）父は"Blackpool"や"Casanovaのデイヴィッド・テナントが演じてくれた。彼は父の古いインタビューを見て演技の研究をしていて、当時の新聞に載っていた写真を携帯電話に保存していたぐらい熱心だった。彼はスーツ、髪型、ヨークシャー訛り、仕草、話し方のリズムも全て完璧に父だった。唯一違ったところはもみあげだけだった。この映画のためにカーディフからドクター・フーの撮影を24時間だけ休んで来てくれて、「もみあげだけは一日で生えさせられなかったんだ」と説明してくれた。"
^ a b c "Desert Island Discs with David Tennant". Desert Island Discs. BBC. Radio 4. 2010年1月1日放送. ^ a b c "Ready Steady Cook with David Tennant and his father". Ready Steady Cook. BBC. BBC 2. 2006年12月6日放送. ^ David Tennant, "Touchstone", in Player of Shakespeare 4, ed. Robert Smallwood (Cambridge University Press, 2000), p.30. ^ The Graham Norton Show. Presenters: Graham Norton. BBC. Radio Two, London, England. 2010年10月9日放送. ^ Latest Casting for John Landis' 'Burke and Hare', although Tennant has yet to confirm his casting. ^ "Catherine Tate interviewing David Tennant". Chain Reaction. BBC Radio 4. 2008年2月21日放送. 1回,4シリーズ. ^ “McDONALD, David John, (David Tennant)”. Who's Who. A&C Black (2008年). 2009年4月10日閲覧。 Online edition Oxford University Press December 2008 (subscription or library card required). ^ "The Christian O'Connell Breakfast Show". Presenter: Christian O'Connell. The Christian O'Connell Breakfast Show. Absolute Radio. 2011年4月11日放送. 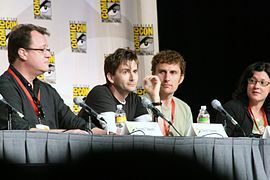 "A couple of you have been asking on Facebook how DT is – David Tennant. I swapped texts with him over the weekend. He is smitten with his new baby daughter." ^ David Tennant to star alongside Doctor Who's Arthur Darvill in ITV drama Broadchurch Radio Times. 2 July 2012. Retrieved 2 July 2012. ^ "Panto Listings", The Stage, 9 December 1993.